Students and faculty gathered in Parmer Recital Hall this past Thursday to hear from poet Julia Spicher Kasdorf and award-winning photographer Steven Rubin as they presented their latest work Shale Play: Poems and Photographs from the Fracking Fields. 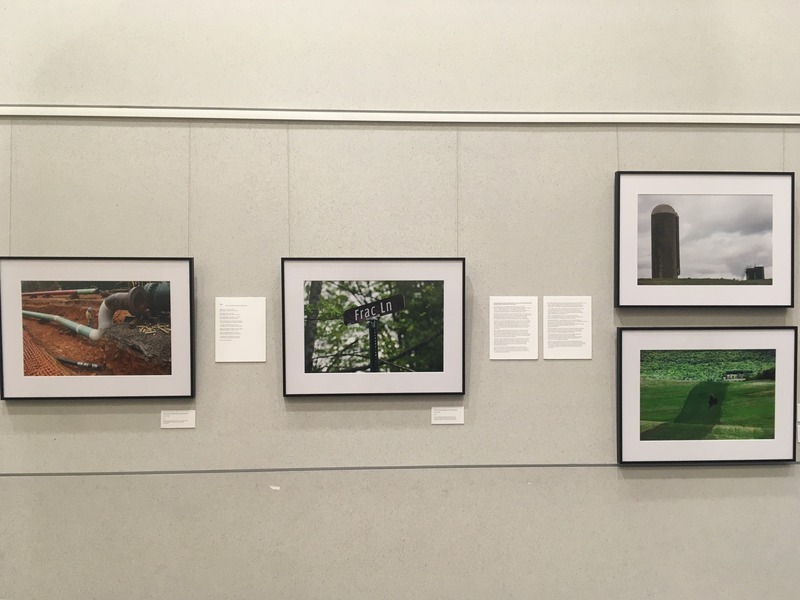 The exhibition was in collaboration with the Messiah College Department of English and The Galleries at Messiah College as part of the Paul W. Nisly Endowed Reading Poets & Writers Series. Shale Play explores the small towns, farms and landscapes of Appalachian Pennsylvania to tell the stories of these places affected by fracking and the working-class people who live there. The Independent Petroleum Association of America (IPAA), defines fracking as the process of hydraulic fracturing as a means of oil and natural gas development. “Shale play” borrows the jargon of the oil and gas industry, referencing a region exploited for its natural gas by fracking and horizontal drilling. These short-term industrial processes can harm the nearby areas in which they occur, creating polarized views across the nation regarding the current pressure to develop more fracking areas worldwide. Kasdorf and Rubin set out to reveal the reality of fracking in their work Shale Play. They followed the footsteps of documentarians in the 1930s who focused their storytelling around the lives of working people—landowners, farmers, miners, teachers, waitresses and homeowners. What resulted was the compelling combination of poems and photographs that told the stories of the natural landscapes impacted by fracking as well as the people who live there in this honest and passionate work of art. Kasdorf is the author of several poetry collections, including her award-winning piece Sleeping Preacher which received the 1991 Agnes Lynch Starrett Poetry Prize and the Great Lakes Colleges Award for New Writing in 1993. Spicher grew up in Westmoreland, Pennsylvania, and is currently Professor of English and Women’s, Gender and Sexuality Studies at Penn State University. Rubin served as a freelance photojournalist and documentary photographer for more than twenty years, traveling on assignment nationwide and around the world. Rubin’s work has been published in The New York Times Magazine, National Geographic, Time, Newsweek and The Village Voice, in addition to a number of other international publications. He is currently Associate Professor of Art with a specialization in photography at Penn State University. Kasdorf’s poems often record the dialogue of conversations she had with the people of Appalachian Pennsylvania, letting their stories speak for themselves as she tells the tale of people impacted by the fracking industry. Rubin’s photographs do the same, displaying bright, piercing images of people, animals and landscapes in the region that portray the disruption of life and land caused by fracking. They are compelling, bold and daring, calling viewers to reflection and consideration. The presentation was followed by a catered reception featuring traditional Appalachian music by Randall Zwally and Sam Brown. The exhibit will be open through March 15 in the upper level of the Climenhaga Galleries.